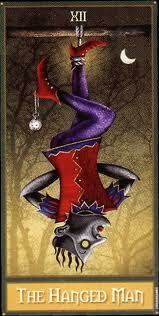 Today's Draw: The Hanged Man from the Deviant Moon Tarot by Patrick Valenza. Do you have a tendency to put things off? Or do you respond so quickly that other opportunities don't have time to present themselves? What lurks on the shadow side of the man who sees life from a different perspective? It's Day Two of Shadow Side Week and today we have the Hanged Man. Traditionally, the Hanged Man can be about taking a pause, making a voluntary sacrifice for a higher good or looking at something from a different perspective. But Patrick Valenza's definition of this card has a perfect shadow side meaning—"A citizen hangs suspended in limbo. He is apathetic and feels no urgent need to alter his situation." Back in spring, I think, I commissioned one of my FBFs for a reading on two areas of my life in which I'd like to make progress. And her blunt reading to me was that I would have to apply myself to those things, or otherwise another year will pass without me doing something about it. At the time I read those words I thought "well, you don't know me very well missy!" Haha. And the truth is, six months later I still haven't made progress on those things and her words now haunt me every day. I admit it. My name is Tierney and I'm a procrastinator. And the reason I was put off by her reading was because she pegged me. And I knew it. This isn't the first year I've been meaning to get around to those two areas of my life. Unlike the Hanged Man, it's not because of apathy, necessarily. It's because my need/desire to change doesn't yet eclipse my desire to stay comfortably the same. And I'll also cop to a little fear of how those changes will change me. So that's one shadow side of the Hanged Man, but here are a few other suggestions. The sacrifice aspect could manifest as someone who martyrs themselves, continually sacrificing their needs for those around them. This perpetuates a victim role that pushes others away, leaving the person to wonder why, when they give so much of themselves, do so few people appreciate and respect them? If the Hanged Man is seeing things from a different perspective, another shadow side might be someone who has closed their mind. Have you ever noticed how many people there are out there with closed minds, yet how few of them will ever admit to it? That's because their minds are closed to the possibility that their minds might be closed....haha. I was reading a political thread the other day where this guy was calling one of the candidates all sorts of unflattering names and spouting innuendo about them while glorifying the other candidate as flawless. Then in the next breath he said his mind was open about the election. If the other candidate could show even one redeeming quality, he'd be open to considering it. And, just as taking too much time to move on your goals can be a shadow side to the Hanged Man, so can acting on impulse...never taking time to consider the consequences before speaking and acting. When we're afraid or angry, it's always a good idea to pause before reacting. Once let out in the ether, we can't take our words and actions back. I had a gentleman caller over here not that long ago and said something that gave me a case of the giggles I couldn't get rid of. My attitude was inadvertently hurtful and I never heard from the guy again. I can't really blame him. Another aspect of acting too quickly is the person who's so on top of their to-do list that they pounce on making a decision or dispatching a task so quickly that they don't give other options a chance to present themselves. Or maybe they're so quick to act that they don't fully understand what they're doing before they do it. These are the people who respond before you even finish your sentence, often missing the entire point of what you were going to say. And before you can explain it to them, they're on to something new. So does any of this sound like you? When you really look at it, what do you think is beneath your shadow behaviors?